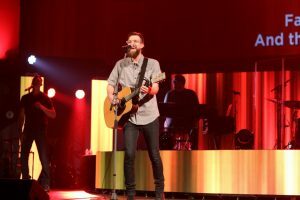 Charlie Hall, a known Christian music artist and worship leader at Oklahoma City, Frontline, led the second session of Night of Praise. DAVIS – The R.A. Young Tabernacle filled up for the Night of Praise, Sept. 2, which served as the opening experience of Falls Creek Baptist Conference Center’s Centennial Celebration Weekend. Night of Praise featured a cast of familiar faces who have led worship in singing over the past 20 years at Falls Creek. Worship artists including Charlie Hall, Jami Smith, Jeff Berry, Brad and Julie Riggins, Logan Walter, Nick Thurmond and Cody Dunbar filled the stage to perform and praise the Lord. Andy Harrison, Falls Creek summer program director and student ministries specialist for the Baptist General Convention of Oklahoma (BGCO), served as emcee for the evening and was pleased with how well Night of Praise went. 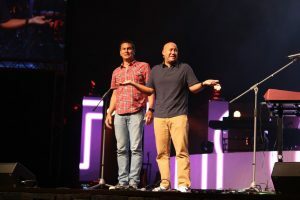 The Skit Guys, who also have been at Falls Creek in years past, shared humorous routines during the event. The Skit Guys have appeared on the Falls Creek stage many times in recent years. He concluded with singing “Revive Us Again,” with many participating in singing, clapping and praising God. The first session of Night of Praise featured the remaining artists all together, sharing the lead among the powerful worship songs. Some shared their own special Falls Creek memories during video presentations. 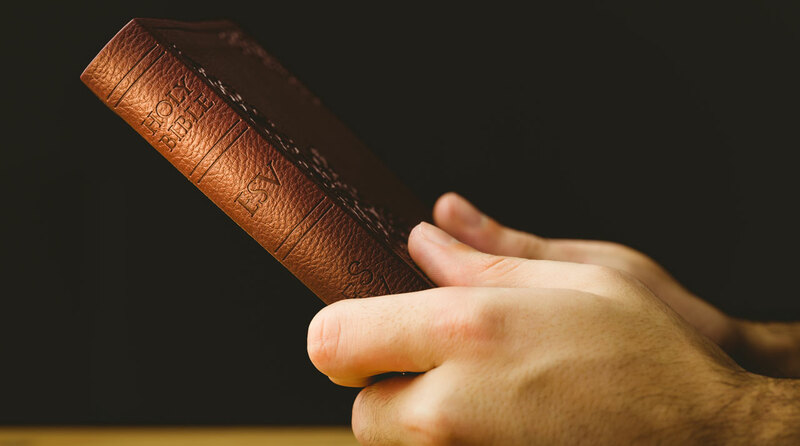 Berry, who currently resides in Nashville, Tenn. and works with new artists, said both his mother and grandmother made professions of faith at Falls Creek. His first experience of leading worship at Falls Creek came in 2000, and Berry said he was honored “to stand on holy ground,” reflecting on the many lives impacted from Falls Creek experiences. Walter, who is worship leader at Austin, Texas, Stone Community, shared his first experience of coming to Falls Creek when he was 6. His father was a member of band called Gabriel that performed during a summer youth week. Walter recalled being with a youth group during cabin time and seeing a video presentation of “The Champion” by legendary Christian artist Carmen. The presentation, which depicted Jesus being in boxing match with Satan, made a lasting impression on Walter, and he said Jesus “has been winning battles on these campgrounds for many years,” expressing his appreciation to be able to lead worship at Falls Creek just as his father did years before. Jami Smith, worship leader at Edmond, Oakdale, sang “Your Love is Deep,” a popular song at Falls Creek over the years. 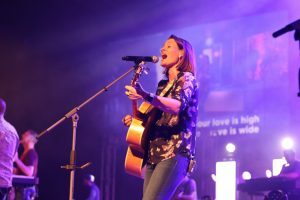 Smith, worship leader at Edmond, Oakdale, said the last time she led worship during a summer youth week at Falls Creek was in 2008, but she has been music leader at retreats and with certain church groups at Falls Creek. Brad and Julie Riggins, worship artists in the Oklahoma City area, were asked by former Falls Creek program director and current Oklahoma U.S. Sen. James Lankford to be worship leaders at Falls Creek in the early 2000s. Julie grew up in Oklahoma and went to Falls Creek in her younger years, and she said it was an honor to be a part of Falls Creek’s 100th-year celebration. Thurmond rounded out the cast who shared the stage in the opening session. He is a frequent worship leader of Christian youth camps and resides in the Oklahoma City area. The opening session concluded with Harrison leading an invitation time, as pastors and youth ministers stood in aisles for people to come visit with them about making decisions for Christ. Matt Roberson, a frequent Falls Creek worship leader for many years, was scheduled to participate but had to cancel. As lead pastor of Houston, Texas, The MET, Roberson is involved in serving approximately 500 people who were affected by Hurricane Harvey and found shelter at his church. 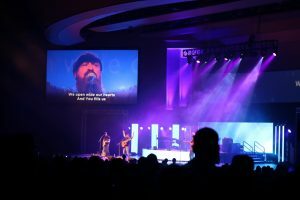 “Sometimes the mission of Jesus means putting some things aside,” Roberson said in a video presentation during Night of Praise, expressing his disappointment for missing the Falls Creek event. He also shared his appreciation for Oklahoma Baptist Disaster Relief volunteers, recognizing their efforts hurricane aftermath. “I love you. I wish I was there with you. I don’t think I could be who I am without Falls Creek,” he said in his concluding remarks in the video to Night of Praise attendees. When Harrison was planning the Night of Praise, he asked Dunbar, worship pastor at Bethany, Council Road, to be the music director for the event. Cody Dunbar, who was the music director of Night of Praise, received roaring cheers and applause from the crowd who appreciated Dunbar’s collaboration efforts. Dunbar received roaring cheers and applause from the crowd who appreciated the event and Dunbar’s contribution for coordinating the many Falls Creek favorite worship artists. Falls Creek saw many come to the grounds beginning at 2 p.m., Sept. 2. Concessions including camp favorite Icees were sold throughout the day, and visitors were able to take tours of Falls Creek to see the many additions and remodeling projects that have been done. The Falls Creek bookstore also offered t-shirts and Centennial memorabilia for sale. The lobby in the Tabernacle featured sections of commemorative items for sale. Disaster Relief volunteers also served hamburgers and side items in Downing Way, near the Tabernacle, where large tents were set up with table and chairs for eating areas. Many churches also took advantage of using their own cabins for the weekend, providing lodging and meals for respective church members. A Homecoming Service will be the final main event for the Centennial Celebration at Falls Creek, beginning at 6 p.m. Sun., Sept. 3. The service will feature Anthony L. Jordan, BGCO executive director-treasurer, bringing a message. A Falls Creek Reunion Choir will be a part of the classic Falls Creek worship service with special musical guest Bill Green. A special video highlighting 100 years of Falls Creek also will be shown. The Falls Creek campgrounds will be opening at 2 p.m. and will offer similar festivities as Saturday.